I have a number of new blog and Twitter followers so I want to post again about my unpublished memoir … so … it’s written and gone through one edit but I need a publisher! If you know anyone interested in a book not only detailing what life is like on a working farm today … but is also interested how real, down to earth regular citizens can affect real change and get real positive public policy enacted … then this is the book for them! Below is the text of an article from a local newspaper that details it … enjoy! GOSHEN — Chris Pawelski, a fourth-generation Orange County onion farmer, once offered a bag of onions for sale on eBay for $150,000. He didn’t get any buyers. But his stunt was picked up by other news outlets and drew attention to the need for an adhoc crop loss program for the Eastern Seaboard after Hurricane Irene leveled crops. It focused attention on the plight of farmers like himself, caught between the havoc wreaked by weather and the sometimes bewildering agricultural policies of the government. Pawelski makes two to three trips a year to Washington, D.C., to advocate for farmers. When he’s out in the field on the tractor, he’s just as likely to be on the phone to someone in government. He even sued the USDA in Federal Court over crop insurance policy. He’s been interviewed, filmed and quoted by diverse sources including Crain’s New York Business, The New York Times, CNN, the CBS Evening News, BBC World Service News, and Univision, and been featured in The Hindu, the largest English-speaking newspaper in India. He’s lobbied lawmakers and cabinet members, including Senator Hillary Clinton, Vice President Al Gore, and current Senators Kirsten Gillibrand and Charles Schumer. He was even quoted in an article in Vogue about Senator Kirsten Gillibrand, who was at his farm for a farm bill meeting. He manages to explain government policy madness in easy-to-understand prose that will have you shaking your head in disbelief. “Roughly 2,500 acres were directly hit by the hailstorm and all of the farmers impacted wanted to quickly destroy the crop and minimize their losses. But, we couldn’t do that. And what prevented us? The United States Department of Agriculture (USDA)…. He can tell you, too, how the large chain stores dictate what kinds of onions they’ll buy, even if the size they want is not suited to growing conditions here. He also wonders why onion farmers here get $7.50 for a 50-pound bag of onions — only a little more than the $6 they received 30 years ago, in 1983. Thanks to the ravages of weather and the government, Pawelski is in debt. He’d like to get his book published, and would welcome backers or an interested publisher. Pawelski started out on a very different career path, but one that made him uniquely suited for his present. He attended the University of Iowa, where he earned a Master of Arts degree in broadcasting and film studies. He taught there for two years and also taught some summer semesters at Northwestern University, back in the 1980s. However, he found himself drawn back to farming, back to Orange County. He and Eve took up farming on 50 acres, alongside his father and brother’s land, in 1993. But as he says, his degree has come into play in dealing with the media. “I’m using it extensively for that, not the way I expected it to be,” he said. He and his wife, Eve, have spent a good deal of the last 16 years involved with public policy advocacy on behalf of farmers and agriculture. He credits his wife with being an equal partner in bringing about some startling improvements in our agricultural policy. “Nothing I’ve done has been by myself; everything is done jointly with my wife, Eve.” Eve works for the Chester school district, and her salary is an important counterpoint to the financial vagaries of farming. Pawelski estimates that, since 1996, approximately 15 to 20 onion farmers have left farming in the county. He would like to see the waterways dredged to avoid repeated crop destruction, including the Roundout creek and Hudson and Walkill Rivers. The Pawelskis are responsible for a $10 million earmark specifically for Orange County onion farmers in the 2002 Farm Bill), changes in crop loss policy, and the creation of a new $50 million Conservation on Muck Soils program passed in the 2008 House version of the Farm Bill, but not the Senate version. It is currently under consideration for inclusion in the 2014 Farm Bill. They’ve brought about changes to the onion crop insurance policy, including doubling the insured expected market price. Chris even testified before the US Senate Ag Committee on crop insurance reform in 2010. 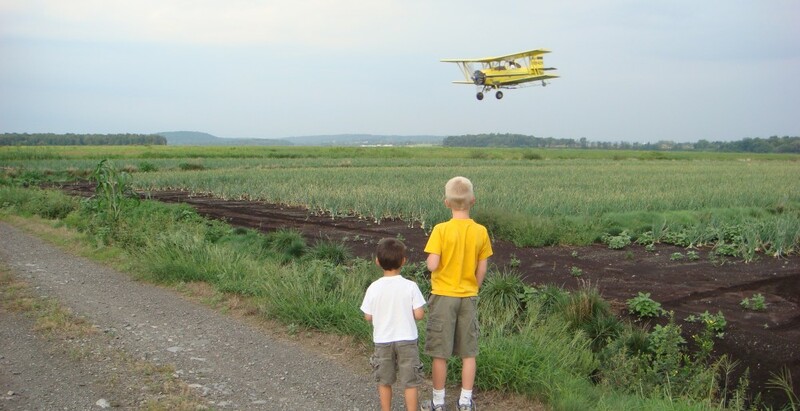 In 2011, the Pawelskis’ onion crop was wiped out by Hurricane Irene, prompting the eBay experiment. But that wasn’t their first brush with disaster. In 1996, the Pawelskis’ crop was wiped out by a hailstorm. Other weather-related disasters occurred in 1998, 1999 and 2000. “Much of what Chris does heavily involves his day-to-day networking to educate local, state and federal representatives, as well as the media, on policies that will improve the conditions for farmers and their workers. It is Chris’s consistent, unrelenting dedication to help farmers that I see from very early in the morning ‘til late at night that I am most proud of. More than one person has asked me over the years when he sleeps. The Pawelskis plan to begin planting this year’s onion crop by the end of the week. Of course, that depends on the right weather conditions. If they plant and it stays cold and or gets too dry, the soil could dry out, and some of it can blow away. Pawelski monitors different weather blogs and websites. It’s safe to say that this week, as always, he’ll be keeping an eye out. Editor’s note: Chris Pawelski’s can be seen on YouTube at http://www.youtube.com/user/ChrisPawelski?feature=mhee or reached on Twitter at https://twitter.com/ChrisPawelski. This entry was posted in Uncategorized and tagged agriculture, black dirt, Chris Pawelski, Eve Pawelski, farming, Goshen Chronicle, Media and the Strange Oddities of Semi-Rural Life, memoir, Muckville: Farm Policy, New York State, Orange County, publisher by chrispawelski. Bookmark the permalink.